French President Francois Hollande called it an "obvious terrorist attack"
A New York City woman vacationing in France was dining at a Nice restaurant amid Bastille Day festivities when people suddenly started stampeding past the eatery, she says. The woman, who asked only to be identified as Kat, had just finished watching the fireworks for the French national holiday along with thousands of others, and went to dinner at a restaurant called Frog, just off Nice's famed seaside boulevard, Promenade des Anglais. Suddenly, "people just started running down the street toward us," she told NBC 4 New York over the phone. "Everyone from the street just flooded the restaurant." "All the restaurants, they shut their front gates and turned the lights off. Everyone was sitting on the floor, and we heard gunshots," she said. A New York City woman vacationing in Nice was caught in the aftermath of the truck terror attack that killed at least 80. This is a still from brief cellphone video she captured while walking home after she and others stayed sheltered inside a restaurant. Kat said everyone sat on the ground for an hour, hushed, unable to connect to anything online because phone service suddenly shut down. Rumors flowed through the restaurant as patrons and shelter-seekers speculated about what was happening outside. One worker at the restaurant had a relative who worked for the local police, and she told him over the phone to keep everyone inside the restaurant -- "it's not all clear." People started getting antsy and wanted to leave when they started to see others walk by the restaurant, Kat said. The restaurant owner resisted, saying, "No, we're not clear to let you go." Finally, when he allowed them to leave, the owner and workers told them they "absolutely cannot go to the right -- go left and keep walking. This whole area is shut down by police," according to Kat. "When we got to where we could turn, there was this square and it was just swarmed with [the French version of] National Guard and police," said Kat. They were on high alert, and anyone who approached them would have a gun drawn at them, Kat said. As Kat walked back to her AirBnb, she said there was a "strange calm" amid the heavy military and police presence and the wailing of police sirens. "Like people trying to act calm as they're walking home, but they're totally freaked and darting from one place to the other," she told NBC 4. "All the restaurants were totally deserted. It was a night of people eating out and celebrating -- and suddenly there's restaurants closed, food left on plates, glasses full of wine, people gone. It was like a ghost town. Like everybody just vaporized," she said. She finally got back to her AirBnb, where friends and family were glued to their TVs, trying to understand what was happening. Kat added, "Please commend the owners of the bars and restaurants who just let everyone off the street. They housed them, tried to keep them calm and informed and safe." Asked if she was certain that the sound she heard from inside the restaurant was gunshots, Kat said she couldn't swear to it but was fairly confident: "I lived in Bed-Stuy and someone was shot on my doorstep. It sounded similar to that." NBC News reports 84 people died after a truck a plowed into pedestrians during Bastille Day celebrations as a crowd watched a fireworks display. Eighteen others are in critical condition. A local official told French media the driver shot at people before he was fatally shot by police. 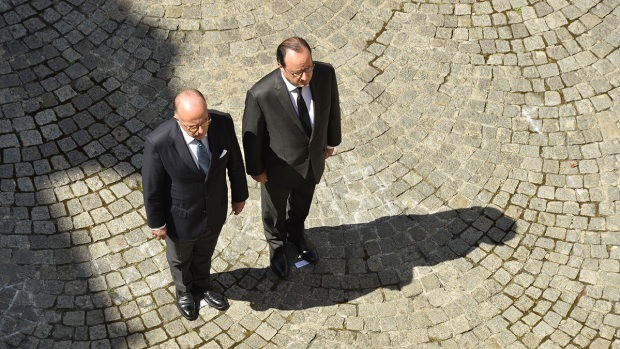 French President Francois Hollande called it an "obvious terrorist attack."